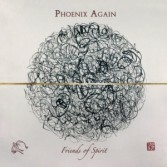 Friends of Spirit is a record that has its roots far back in time. In the mid-seventies, three brothers who lived in a small town in the Bassa Bresciana, Castel Mella, famous only for having experienced the unfortunate fate of the flood on November 4, 1966 (exactly, the same date as the Florence flood), they were starting to develop a visceral love for the acoustic guitar. In fact, Claudio, Antonio and Sergio enjoyed cheering up their mornings by playing their unplugged versions of some of their favorite artists' tracks: Mike Oldfield's Tubular Bells, Inti Illimani's entire albums, You've Got A Friend by James Taylor, almost all the songs on the 4 Way Street album by the quartet Crosby, Stills, Nash & Young, and many others. Playing these songs convinced them even to found a musical ensemble with which they could propose live, armed with their inseparable Eko Ranger 12 string (aka, the Italian Guitar par excellence), the successes of the main Italian singer-songwriters and of international folk music (in particular North and South American way). most of the songs you can listen to on our records, from ThreeFour to Look Out, from Unexplored to the last effort, Friends of Spirit. Recording an album almost exclusively with acoustic instruments, with only a few atmospheric passages that leave the place for the entry of electric guitars and synths, for all of us, was an almost natural gesture, especially after having first experienced also what we did let's define "our acoustic set".